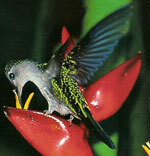 Name of God: Huitzilopochtli or Hummingbird of the South or Left. Siblings: 2 Sisters called Coyolxauhqui, the moon goddess, and Malinalxochitl. 400 brothers called the Centzonhuitznahua: each one is a star. 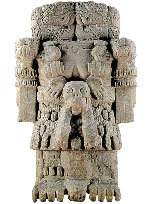 (Pic 2) Coatlicue (meaning ‘Skirt of Snakes’), earth goddess and Huitzilopochtli’s mother. Museo Nacional de Antropología, Mexico City. Huitzilopochtli was the Patron of the Mexicas, who are more generally known as the Aztecs. He symbolized the sun, war, youth and conquest. Great human sacrifices were regularly performed in his name. One day, Coatlicue was ritually sweeping in Coatepec mountain. As she worked, a ball of white feathers floated down to her, so she took it and stowed it by her breast, under the folds of her skirt. When Coatlicue went to examine it later, the ball of feathers had disappeared but she found she was pregnant. Coatlicue had a daughter called Coyolxauhqui and 400 sons called the Centzonhuitznahua and when they discovered their mother’s pregnancy they were terribly angry. Coyolxauhqui plotted with the others to kill Coatlicue in revenge for the shame their mother had brought upon them. Upon hearing their plot, Coatlicue was greatly saddened, but her unborn child, Huitzilopochtli, spoke to her and told her not to fear for he knew what he must do. Meanwhile, Coyolxauhqui and the Centzonhuitznahua prepared for war, twisting their hair and arming themselves. 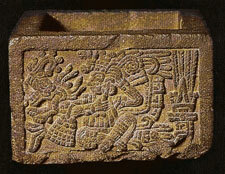 On the day of battle, the brothers and sister marched towards Coatepec and the pregnant Coatlicue. One of them, Quauhitlícac, secretly went to Coatlicue and helped the unborn Huitzilopochtli to see how the Centzonhuitznahua were approaching. Once his siblings got to Coatepec mountain in order to kill their mother, Huitzilopochtli sprang from Coatlicue’s womb and with the fire from a snake in his hand, called a xiuhcoatl, he killed his sister who was at the head of the group, throwing her head into the Coatepec mountain and ripping her body apart. Next, he killed almost all of his 400 brothers. Huitzilopochtli’s calendar sign: Ce Tecpatl (1 sacrificial knife/Flint). This is the tenth of twenty thirteen-day periods that constitutes the 260 day ritual calendar. Men born beneath this sign were predicted to be brave, honourable and rich whilst women would have many abilities, be manly, good cooks, well spoken and discreet. All of the following signs during this 13 day period were said to be prosperous. Festive month: Panquetzaliztli or the ‘raising of flags’. This festive month was celebrated from the 2nd until the 21st of December (the Aztec solar calendar had 18 periods of 20 days plus 5 unlucky days at the end of the year). This ceremony re-enacted the epic voyage of Huitzilopochtli and the Aztec migration from Aztlán in the north to Tenochtitlan. Other festivities featuring Huitzilopochtli include Atamalqualiztli, that occurred every eight years around the November/December period, and Toxcatl which revolved around the god Tezcatlipoca. If you look at Picture 6 you will see the main temple in Tenochtitlan that was dedicated to the rain god Tlaloc (left) and Huitzilopochtli (right). Interests: Sacrifice, war and, above all, looking after his people, the Mexicas, and ensuring that they were faithful to him. Powers: According to Sahagún, Huitzilopochtli was robust, strong, warlike and a great destroyer of towns and men. In wars he was like “live fire”, and fearsome to his adversaries. His emblem was of a “dragon’s head that spewed fire from its mouth” (xiuhcoatl). He could also transform himself into different birds and beasts. 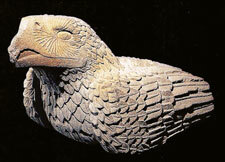 (Pic 7) Quauhxicalli in shape of an eagle, Museo del Templo Mayor, Mexico City. Symbolic forms: In his role as warrior, Huitzilopochtli was the sun. His celestial circuit has been interpreted as the model that all life-cycles follow; those of men, periods and eras. 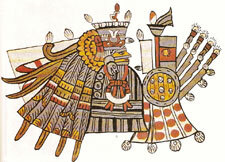 As a dweller of land, Huitzilopochtli was the sun eagle that devoured a snake’s tail, emblem of darkness. He was sometimes a hummingbird, the soul of a dead warrior, and he could be a snake, symbol of a people settling in its promised land. 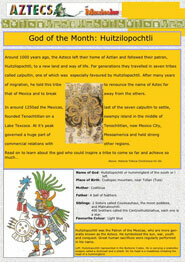 As a nocturnal being, Huitzilopochtli appeared as a Tzitzimitl, a scary skeletal apparition. (Pic 8) Mixtec cup with hummingbird, late post-classic, Zaachila, Museo Nacional de Antropología, Mexico City. Blood thirsty: Huitzilpochtli had strong links to the sun and for this reason he required a "constant supply of sacrificial victims” (“The Aztecs”, Smith). Those who had died in war, at the mercy of their enemies as captives, or during childbirth, were allowed to accompany the sun on its voyage through the heavens. According to Sahagún’s informers, these dead people would wait on a plain until the sun started to rise. Its brightness was blinding and only those that had many arrow holes in their shields would be able to look through them, at the sun, without being hurt. In this way, only the very bravest warriors could get a good view. After four years, the souls of these dead people turned into hummingbirds and butterflies and came back down to the earth. 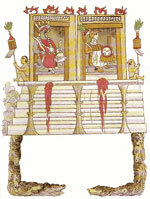 (Pic 10) Zacatapayolli box with Huitzilopochtli performing self-sacrifice. Museo Nacional de Antropología, Mexico City. According to experts, there are very few remaining archaeological representations of Huitzilopochtli. The zacatapayolli box (Picture 10) was used to collect hearts taken out of peoples’ chests during sacrifice. It shows the deity completing an act of self-sacrifice. In Mesoamerican religion, Huitzilopochtli was a relatively new deity, so he wasn’t widely represented in calendars from the pre-Hispanic era. In colonial codices he has only been identified in pieces concerning the search for Tenochtitlan. In these, he can appear as a man wearing a hummingbird helmet or as part of a sacred ‘load’. 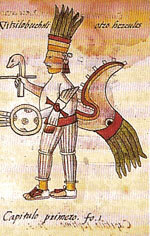 The image from the Tudela Codex (Picture 11), shows Huitzilopochtli as patron of the Panquetzaliztli festivities. Huitzilopochtli ‘in the flesh’: Important descriptions of the god can be read in colonial chronicles. For example, during the Toxcatl celebrations (16th May�“ 4th June, dedicated to the god Tezcatlipoca), a figure of Huitzilopochtli was made from amaranth dough. It was then painted, dressed and adorned and set up to receive offerings. A ‘live image’, a man, represented Huitzilopochtli and was afterwards sacrificed in his honour. Both of these ‘images’ had, on their heads, the adornment of a sacrificial stone pointing outwards, half covered in blood. “El gran ausente Huitzilopochtli, su representación metafórica”, Yolotl González Torres, Arqueología Mexicana, vol.22, 1996, pp 70-72. “El sacrificio humano entre los mexicas”, Yolotl Gozález Torres, Arqueología Mexicana, vol.15, 1995, pp 4-11. “Los dioses del Altiplano central”, Michel Graulich, Arqueología Mexicana, vol.20, 1996, pp30-39. “Imágenes del Museo Nacional de Antropología”, Arqueología Mexicana, special edition no.1. “Fauna: imágenes del ayer y hoy”, Arqueología Mexicana, special edition no.4. León Portilla, Miguel, “De Teotihuacan a los aztecas: fuentes e interpretaciones históricas”, 2nd ed., UNAM, 1983, Mexico City, Mexico. López Austin, Alfredo and Leonardo López Luján “El pasado indígena”, coord. Alicia Hernández Chávez,2nd edition, Colegio de México, 2001, Mexico City, Mexico. Molina, Fray Alonso de “Vocabulario en lengua castellana y mexicana y mexicana y castellana”, preliminary study by Miguel León Portilla, 4th edition, Editorial Porrúa, 2001, Mexico City, Mexico. Tezozomoc, Fernando Alvarado, Crónica Mexicayotl, translated by Adrián León, 3rd ed., 1998, UNAM, Mexico City, Mexico. Sahagún, Fray Bernadino de, Historia general de las cosas de Nueva España, Comments by Angel María Garibay, 6th ed., Editorial Porrúa, 1985, Mexico City, Mexico. Smith, Michael E. “The Aztecs”, 2nd edition, Blackwell Publishing, 1996, Oxford, UK. THANK YOU SOOOOOOOOOOOOOOOO MUCH FOR THIS INFO. i HAVE BEEN REASERCHING FOR HUM PREP AND THIS IS AWESOMMMMMMMEEEEE! this is absolutely facinating! my fiancee is of mexican descent and I believe his history goes back to the aztec/mayas. thankyou for all the wonderful info/photos. I love aztecs, ecpesally their gods!! !i think they are amazing!!!! im proud to say that im a mexicano from san diego califas.oceanside,and i just wanted to say muchas gracias for some good info on our back ground and would like to get more feedback on our great ancestors.